Jonesboro, Ark. — Trailing 13-0 at halftime and with their starting quarterback sidelined with an injury, the Western Kentucky University football team scored 26 unanswered points after halftime knock off Arkansas State 26-13 Saturday night at Liberty Bank Stadium in the Sun Belt Conference opener for both teams. The win moved the Hilltoppers to 4-1 on the season and 1-0 in the Sun Belt. It also gave WKU its eighth straight conference victory dating back to last season. ASU dropped to 2-3 and 0-1 in league play. Senior quarterback Kawaun Jakes suffered an injury late in the first half, forcing redshirt freshman James Mauro into action coming out of the locker room. Taking over near midfield early in the third quarter following an ASU punt, Mauro was able to hook up with Boe Brand on a 22-yard completion early in the drive. Then, faced with a third-and-seven, an eight-yard completion to Antonio Andrews kept the offense on the field. A pass-interference call in the end zone gave the Toppers the ball at the two. Two plays later, Mauro connected with Mitchell Henry on a one-yard scoring pass to make it a 13-7 game with 6:44 left in the quarter. The WKU defense came up with the first takeaway of the game on the ensuing drive as Xavius Boyd intercepted a Ryan Aplin pass and returned it to the ASU 37. It took the offense just three plays to go the distance as Mauro and Henry hooked up again on a scoring pass — this time from 22 yards out — to give the Hilltoppers a 14-13 lead with 5:08 on the clock. In three third-quarter drives, Mauro was able to complete eight of 11 passes for 104 yards and the two scores. The Hilltopper defense was able to force another punt by the Red Wolves, taking over at their own 37. Mauro hooked up again with Henry on a 17-yard completion, then hit Brand for 24 yards to quickly get the ball down to the ASU 18. A 12-yard run by Andrews put him over 100 rushing yards for the third straight game, setting up the Hilltoppers first and goal. However, the ASU defense held, forcing WKU to settle for a 22-yard Garrett Schwettman field goal to push the lead to 17-13 with 14:10 remaining in the fourth quarter. After giving up 212 yards to ASU in the first half, the Hilltoppers limited Arkansas State to just 123 total yards following halftime. That included just 71 yards prior to a final drive when the game was in hand. After forcing another Arkansas State punt at the 10:24 mark of the quarter, WKU was able to go 75 yards in nine plays. The Toppers ate up nearly five minutes of clock before Andrews capped the drive with a two-yard touchdown run, stretching the lead to 23-13 with 5:25 remaining after a missed PAT. WKU was able to force the Red Wolves into a fourth-down situation on the next drive, and an Aplin fumble was recovered by Rammell Lewis at the 24-yard line to give the Hilltoppers the ball back at the ASU 24. The offense was able to eat up nearly three minutes of clock before a Schwettman 27-yard field goal pushed the advantage to 26-13 with 2:56 remaining, ending the scoring for the night. Andrews finished with 29 carries for a career-high 215 yards and a touchdown — an average of 7.4 yards per carry. It was the third straight game that Andrews has rushed for over 100 yards. 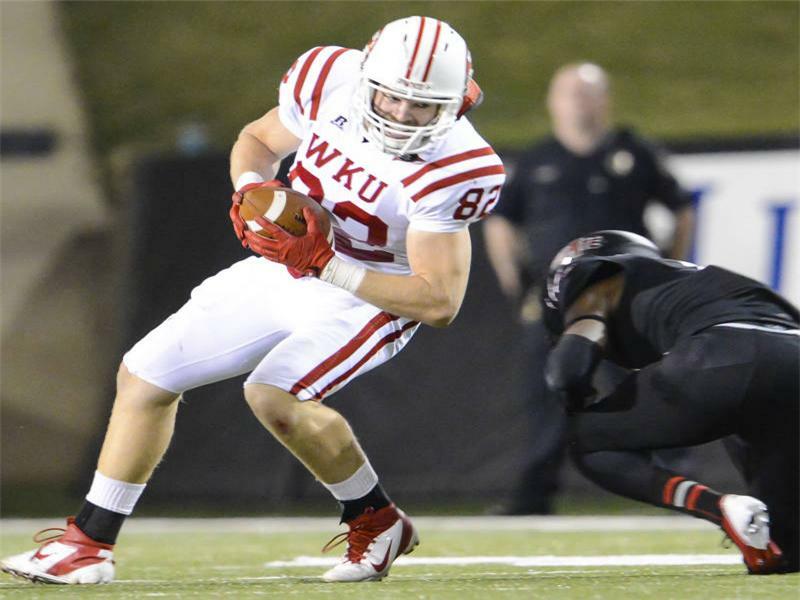 As a team, WKU finished with 243 rushing yards after posting just 96 in the first half. Mauro completed 8-of-12 passes after halftime for 104 yards and two scores. He hooked up with Henry four times for 43 yards and two scores. Defensively, Andrew Jackson posted a season-high 12 tackles, including two tackles for loss. Quanterus Smith set tallied 5.5 tackles for loss, including a career-high 3.5 sacks. In all, WKU made 13 tackles for loss in the contest. Aplin, who came into the game completing 61.8 percent of his passes and averaging 240.2 yards, was limited to 23-for-40 passing for 204 yards. It was a different story in the first half as Arkansas State was able to control the ball offensively, and shut down WKU’s offense in the first 30 minutes. However, the Hilltopper defense was able to come up with stops late in drives to limit the ASU scoring and give the offense a chance at a comeback in the final 30 minutes. After both squads came up empty on their opening possession, the Red Wolves were able to draw first blood, going 66 yards in just over six minutes. After moving inside the Hilltopper 10, the WKU defense was able to hold, including a pass breakup from Kiante Young on third down. That forced a 20-yard field goal from Brian Davis to put Arkansas State on top 3-0 with 4:27 remaining in the opening period. The WKU defense bent but didn’t break again as the Red Wolves put together an 11-play, 64-yard drive to once again get into the red zone. Again the Hilltoppers were able to hold as Davis connected from 33 yards to give ASU an 6-0 advantage with 12:59 left before halftime. The Red Wolves were able to limit WKU to just 104 yards of offense in the first half, and also had the ball for over 18 minutes. A WKU punt pinned ASU at the seven-yard line, but a 16-play, 93-yard drive ended with a four-yard touchdown pass from Fredi Knighten to Anthony Kincy with nine seconds left, sending the Red Wolves to the locker room with a 13-0 lead. After having the ball for just 11:57 in the first half, the Hilltopper offense was on the field for 18:25 in the second half to win the time-of-possession battle. 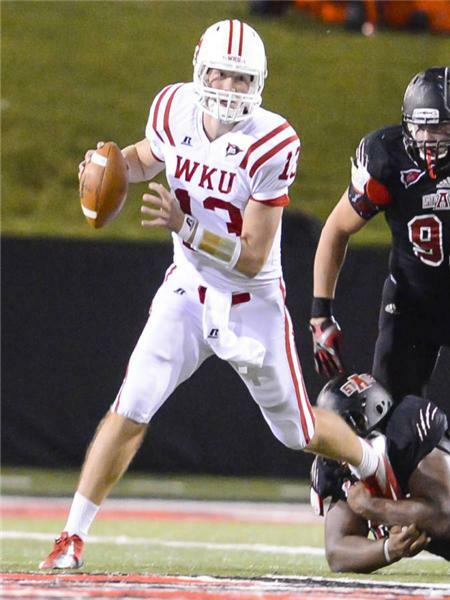 The Hilltoppers posted 365 yards of total offense in the contest, including 251 yards in the second half. Fourteen of WKU’s 19 first down also came after intermission. The Hilltoppers will have a 12-day break before hitting the road to face Troy on Oct. 11. The Thursday-night contest will be televised nationally on ESPNU and will kick off at 6:30 p.m. (CDT).